Advantages: Experience in full colour both mid and late production 109 Gs in action with high quality sound recordings. The world population of airworthy Me 109s is unfortunately not increasing like P-40s and Hurricanes. airworthiness. Presently there are only two 109 Gs making airshow appearances in Germany and a 109 E in Canada. For those fortunate enough to be able to see one fly at an airshow, it is a wonderful and unique experience. This DVD captures the moment to enjoy from our armchairs! Most of the production was filmed in 1995 when two 109s were flying at Duxford airfield England. "Black 6" a G-2 and "Black 2" a Buchon fitted with a Daimler Benz 605 D ,appropriate engine cowlings, extended tail wheel and tall rudder -a pretty convincing looking G-10. 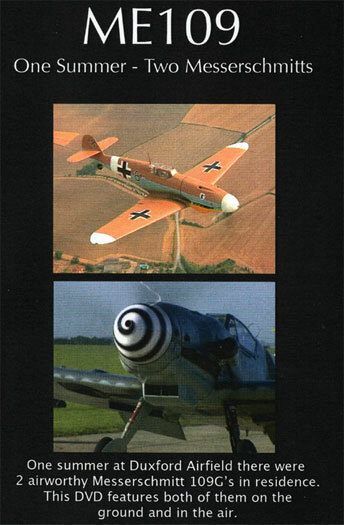 The DVD has a minimum of commentary so that the viewer can lap up the terrific sounds of the German engines starting up, taxiing, takeoff, fly pasts and " in cockpit" .The Daimler Benz audio signature is truly unique and quite different to the V12s we commonly hear in Mustangs and P-40s. Black 2 also has a deeper sound than the DB 605A on the G-2. One of the highlights is several low fly pasts of the G-10 coming directly toward the cameraman-great stuff. 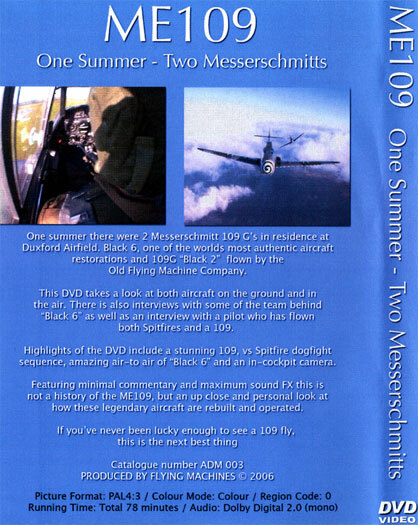 This is a super DVD that gives an intimate experience of the 109. It will probably inspire you to build more 109s ! Perhaps a spinning prop ground run with proper audio. Ebay.UK . Format is either region 1 or region 2.